The HTC HD2 might be an aging device but no one can deny the fact for what it is capable of running. Apart from the stock Windows Mobile 6.5 ROM it ships with, it can run Android and Windows Phone 7 as fluent as if both the OS’s were made for the HD2 itself. And now it can run the latest and greatest offering from Microsoft: Windows Phone 7 Mango! 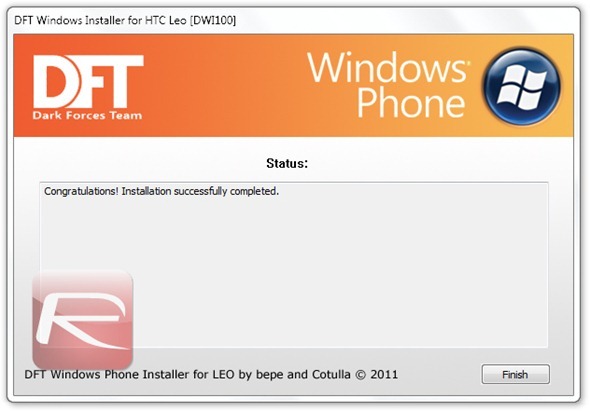 Currently at the moment, Windows Phone 7 Mango is in its early beta stages and is available only to developers. 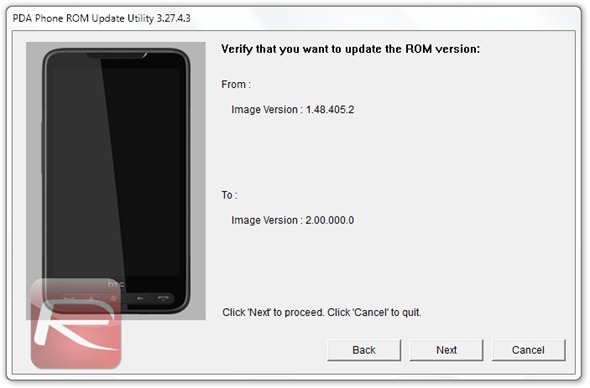 But that didn’t stop a handful of hackers from getting the developer beta ROM onto the HD2. Here’s a complete guide on how you can install Windows Phone 7 Mango on the HD2, and that too with a working Marketplace for downloading apps and the ability to sideload apps as well, something which Microsoft doesn’t allow anyone to do, unless you’re willing to pay a fee for it. Apart from these four files which you can grab from the links provided above, you’ll need an HTC HD2 and its USB data cable. Make sure your HD2 is fully charged before you begin, just to be on the safe side. We’re assuming that you don’t have MAGLDR installed on your HD2 and running the stock Windows Mobile 6.5 ROM. 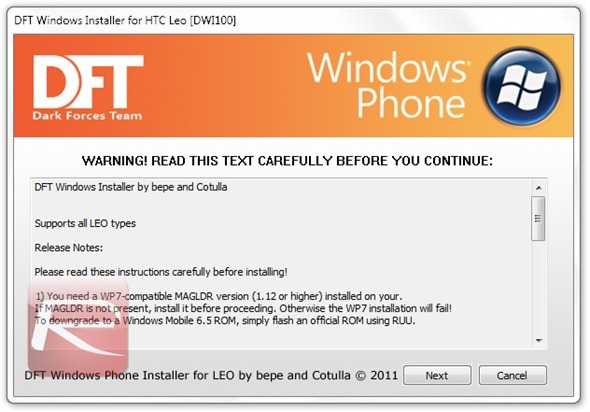 In case you do have MAGLDR installed then just directly skip over to step 16 and follow the guide onwards on how to install Windows Phone 7 Mango, otherwise start from step 1. Keep in mind that flashing Hard SPL is the first and the most key step before things progress forward, and flashing it is a piece of cake! 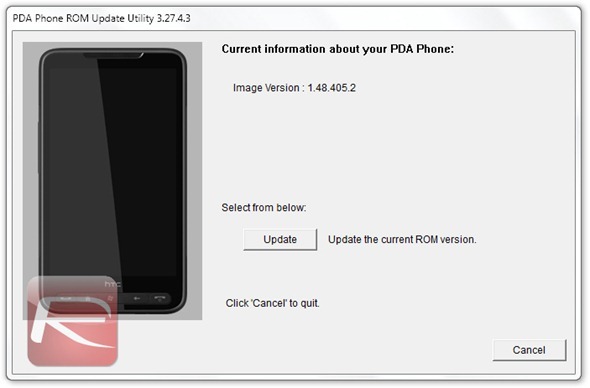 If you’re already running stock Windows Mobile 6.5 then chances are high that you’re running SPL 1.42, which is a no go if you’re planning to install Windows Phone 7 on your HD2. Step 1: Power off your HD2. Step 2: Power back on while holding down the power button and the volume key down at the same time to enter bootloader mode. Step 3: Once you’re in bootloader mode, connect your HD2 with the USB cable to your PC. While in bootloader mode, you should see USB written at the bottom of the screen. 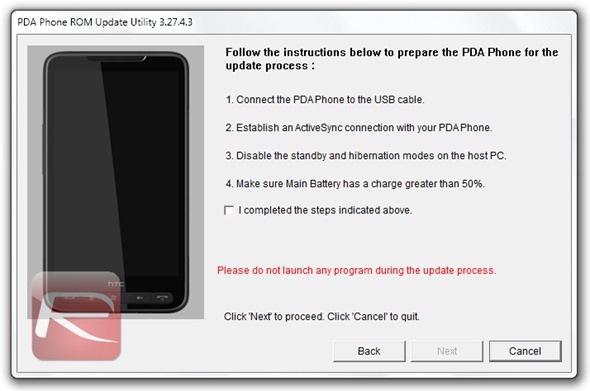 Step 5: Follow the onscreen instructions and install HSPL 2.08, wait for it to do its thing, and in a matter of couple of minutes your device will be running HSPL 2.08 and you’re ready to move forward. 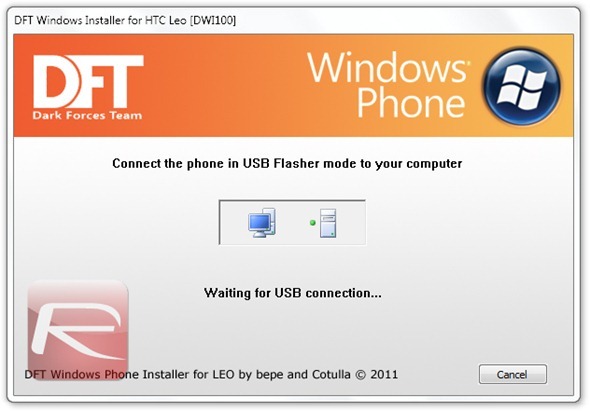 Flashing a new radio which supports 576 MB is also important for Windows Phone 7 Mango to work on the HD2, and just like Hard SPL, flashing this is a piece of cake. Step 6: Power off your HD2. Step 7: Power back on while holding down the power button and the volume key down at the same time. Step 8: You’re now in bootloader mode. Step 9: Unzip the new radio files on your desktop, launch the CustomRUU.exe file, follow onscreen instructions for installation, that’s all. Step 10: Power off your HD2. Step 11: Power back on while holding down the power button and the volume key down at the same time with the USB cable connected to your PC. Step 12: You should now be in bootloader mode and you should see “USB” written on the bottom, if you performed the steps correct of course. Step 13: Extract the MAGLDR files you downloaded earlier on your desktop, once its done, launch the ROMUpdateUtility.exe file. Step 14: Now follow the on screen instructions in order to install the ROM Update, which is of course MAGLDR in this case. Step 15: Once everything is done, your HD2 will boot into MAGLDR, at this point put your phone into USB Flasher mode, scroll down using the volume keys and hit the hardware call send button to confirm. Step 16: Extract all the Windows Phone 7 Mango files on your desktop which you downloaded earlier. Step 17: In the extracted files, you should see a file named DWI.exe, launch it and you should see a window as show below, and follow the on screen prompts till flashing begins. Step 18: Grab a drink and rejoice! 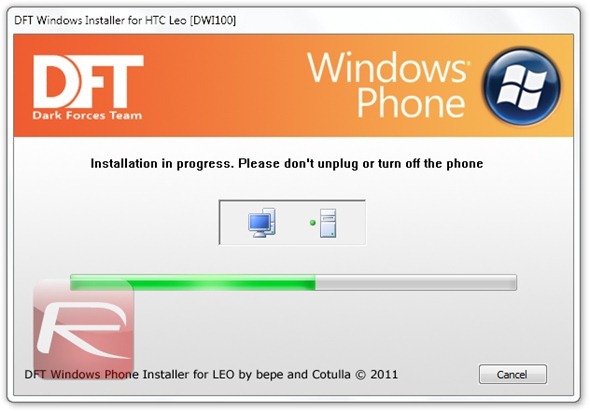 Now your HD2 will boot up into Windows Phone 7 Mango, that’s it, you’re done! 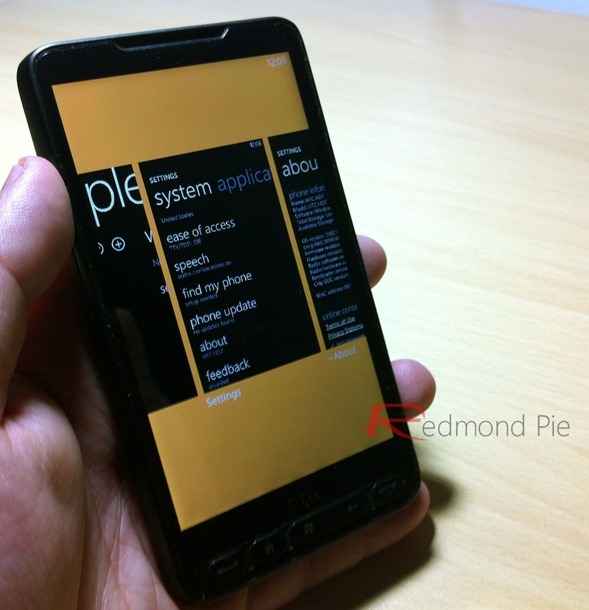 After using Windows Phone 7 Mango on the HD2 for a handful amount of time, there are a few things which we would want to share with you guys. The performance of the ROM on the HD2 is remarkably good, but there’s a catch to it, its very buggy, therefore don’t expect this to be your primary smartphone for daily use in any case. It freezes up occasionally, and you’ll highly likely end up removing the battery to restart the device.